Last week we celebrated the life and accomplishments of a great man — Dr. Martin Luther King, Jr. We were reminded that the best way to honor him is to serve others. Dedicating your life to the service of others is hard. After all, as someone said on my twitter feed, it is easy to make a pay check, but can you make a difference? A total dedication to the service of others is too much for most of us, (I could never imagine doing what Dr. Martin Luther King, Jr. did.) but there are as many ways to serve as there are talented people in the world. Service can be big — saving a life, curing cancer, changing a nation, for instance. Service can be small — ushering at your neighborhood theatre, tutoring a student, donating blood to the Red Cross. Whether big or small, service can make a huge difference in another person’s life. The side benefit is that it sets you on a path to receive even more than you gave. 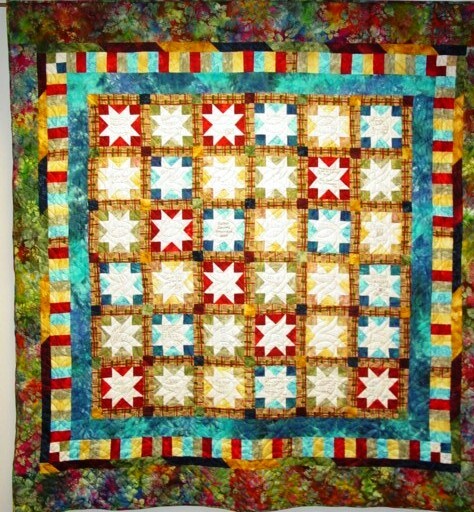 The quilt featured here is called Fulton County Attorney Stars. This is one of several quilts I made to honor the incredible lawyers in the Fulton County Attorney’s office. (Each staff member signed a block in the quilt). It’s easy to make a pay check, but can you make a difference?